The Chicago Bears were one of the worst defenses in the NFL last season. They were particularly dreadful at the line of scrimmage. Adding Lamarr Houston is a great first step in rebuilding a front seven that fell apart. Houston is not the dominant edge pass rusher that the Bears once had in Julius Peppers. His specialty is stuffing the run. Houston can set the edge from the defensive end position, and redirect running backs to the other side of the field. Although the Raiders never really took advantage of it, Houston does offer great versatility. He can rush the passer from the end position, but provides great value as a three-technique inside. The Raiders primarily left him outside, and did not utilize most of Houston’s unique skillset. If Mel Tucker, and the Bears’ defensive staff are smart, they will differ from that model. In Chicago, Houston should play the defensive end position on early downs, and move inside to rush the passer. He has the quickness to overwhelm offensive guards, as well as great strength and solid technique. Lamarr Houston has his best football ahead of him. Now that he is on a new team, it isn’t out of the question he has a career year. If the Bears move him around more than Oakland did, Houston will obliterate the six sacks he recorded last season. This is a great addition, an ideal starter on their defensive line. However, the Bears still have a lot of work to do here. They will be on the look out for a true edge rusher in the draft. This is very similar to the Raiders allowing Jared Veldheer walk. Veldheer was their best offensive player, and Lamarr Houston was easily their best defender. It is absolutely inexcusable that the Raiders would let a player of Houston’s caliber go without any compensation; especially given their salary cap situation. Reggie McKenzie and the front office had the resources to match, or exceed, the Bears’ offer but didn’t step to the table. Outside of Sio Moore, the Raiders do not have a single ascending, blue chip player in their front seven. Veteran addition, Justin Tuck, will assume Houston’s role, but will not provide the same production. Last season the Raiders got by with several cheap veterans on the defensive line. Now that they’ve lost their only good homegrown player, it will be even more of the same in 2014. 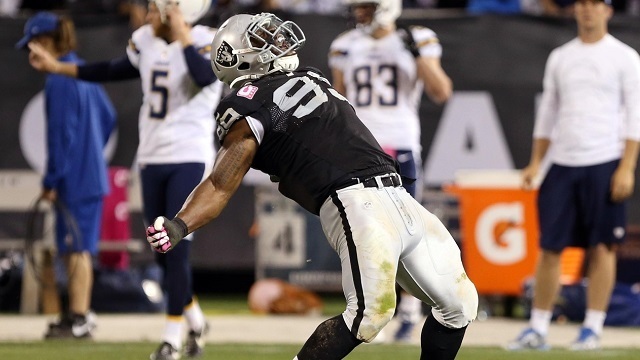 Without a doubt, the Raiders are worse off for letting Lamarr Houston out of the building. Defensive line is now just another pressing need for Oakland. Speculation surrounding McKenzie, and the Raiders’ plan, should grow in the wake of this error. The Bears get a pretty good deal with the Lamarr Houston contract. Chicago didn’t overpay as if he were an edge rusher, and properly valued him. Houston will make $7 million annually, and only gets $15 million in guaranteed money. His cap number will never hit $9 million at any point in the five years. In addition, the contract has a team friendly out, so the Bears are protected on the off-chance Houston doesn’t perform. Its rare you see a young defender scooped up on the first day of free agency for such a value. The Bears filled one of their biggest needs, and did not overspend in doing so. If the Bears utilize Houston in a way that better suits his skills, the deal will look even better. In the next few years we’ll probably look back on this signing as one of the bigger steals. I’ll predict that Houston’s best football has yet to come. However, unless the Bears make some more dramatic moves, it might not show in 2014. As it stands today, Houston is far and away the best defensive lineman the Bears have. Offenses will likely focus most of their attention to getting him blocked. The Bears are still looking to add some more talent to the front seven. Phil Emery did add Willie Young in free agency, and he’ll be the pass rusher to take the defensive end spot when Houston moves inside. They will form a nice tandem. Nevertheless, Houston will be a force for the Bears against the run. Chicago was gashed on the ground with ease, that won’t happen with their new addition on the line. He will tie up blockers, and young linebackers like Jon Bostic will look better for it. As the team adds more complimentary threats for Houston, they will reap more benefits from his signing there. The sacks and big stats will come soon enough for Houston in the Windy City.